PUBLiCUS Asia Inc.’s Latest PAHAYAG poll focuses on Luzon voters - PUBLiCUS Asia, Inc. The PAHAYAG Luzon poll is the first among the series of PUBLiCUS’ geographic studies with the goal of providing better assessment and drilling down of the differences in opinion among Filipinos across the country. PUBLiCUS Asia will be sharing with you very soon the results of its PAHAYAG Luzon poll – a Vox Opinion Research dedicated poll that looked into the sentiments and insights of Luzon respondents (excluding the NCR) on relevant national issues. The study was conducted last May 7-11 among 1,800 registered voters from the Cordillera Administrative Region (CAR), Region 1, Region 2, Region 3, Region 4A, Region 4B, and Region 5. A separate dedicated poll of opinions of voters in the NCR will be undertaken this year. The PAHAYAG Luzon poll is the first among the series of PUBLiCUS geographic studies, with the goal of providing better assessment and drilling down of the differences in opinion among Filipinos across the country and delve into the intricacies of the Philippine island groups. PUBLiCUS also deems it necessary to look into the opinion of Luzon, being the largest island group in the Philippine archipelago composed of 8 regions with 38 provinces, 71 cities and 699 municipalities. It represents 55.9 percent of 54,363,844 total registered voters of the Philippines as of 2016. Balance Luzon, meanwhile, represents 44.45 percent of the total registered voters in the country. Aside from Luzon-specific questions tailor fit for the respondents, Balance Luzon voters were asked about opinions on the issues covered by PAHAYAG’s regularly tracked modules: Living standards; The Country (State of the Nation); and Love, Care & Concern of Leaders. Respondents’ sentiments on issues under specific modules namely, National Interest; Political Issues; Political Parties, Predisposition toward the 2019 Senatorial Election; Media Habits, and Endearing Philippine Brands, were also measured. PUBLiCUS has upgraded its research arm by shifting from the traditional pen and paper interviews (PAPI) to computer-assisted personal interviewing (CAPI) data collection method. With its commitment to good quantitative research, PUBLiCUS also developed its own mobile survey application known as VOX Survey designed to deliver a fast-turnaround for survey results and provide a more accurate, more actionable picture of what the people think. 2017 was a big year for PUBLiCUS’ research arm, Vox Opinion Research. Last August 2017, PUBLiCUS launched its very first PAHAYAG Pilot Study and introduced the Love, Care, and Solidarity of Leaders Index (LCSI), a new metric in measuring Filipinos’ perception toward their elected leader, and the Decisiveness Index, setting it apart from other polls and offering new ways of measuring performance of government leaders in the eyes of the public. The first PAHAYAG Online Pilot Poll, on the other hand was launched in 2017. It aimed to establish a baseline for Filipino millennials on their brand of politics, economics, and a number of social issues. It will solicit the millennial’s opinions on extra-judicial killings (EJKs), war against illegal drugs, their view of the country’s leaders, and their sense of belonging to their family, society, and country. The respondents were also asked about the values they uphold, their priorities and goals in life, and how they perceive the direction of the country’s future. 2018 will be another big year for PAHAYAG as aside from the Balance Luzon study, a separate and dedicated poll on Visayas & Mindanao, NCR, and Nationwide face to face and online polls will be conducted. 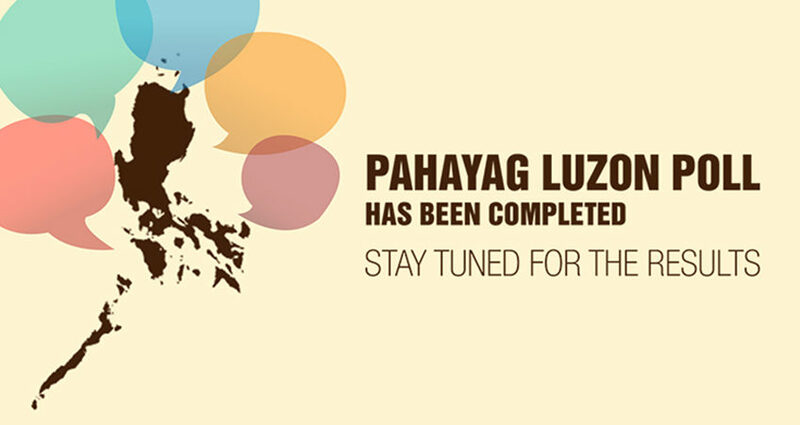 Stay tuned for the complete PAHAYAG Luzon report!